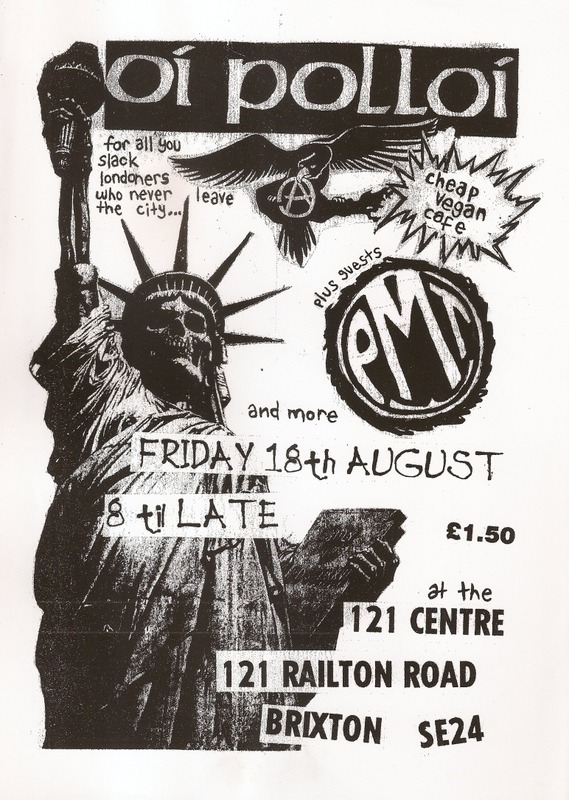 The 121 Centre in Brixton, variously known as an ‘anarchist centre’, ‘social centre’ and ‘squatted centre’, was a hub of international radical activity and much else throughout the 1980s and 1990s. The house at 121 Railton Road, SE24 was first squatted by a group of local anarchists in 1981 and was finally evicted in 1999 (it is now private flats). Its four storeys included a bookshop, office space, printing equipment, kitchen and meeting area, and a basement for gigs and parties. Over 18+ years it was the launchpad for numerous radical initiatives, some short-lived, others having a more lasting impact. 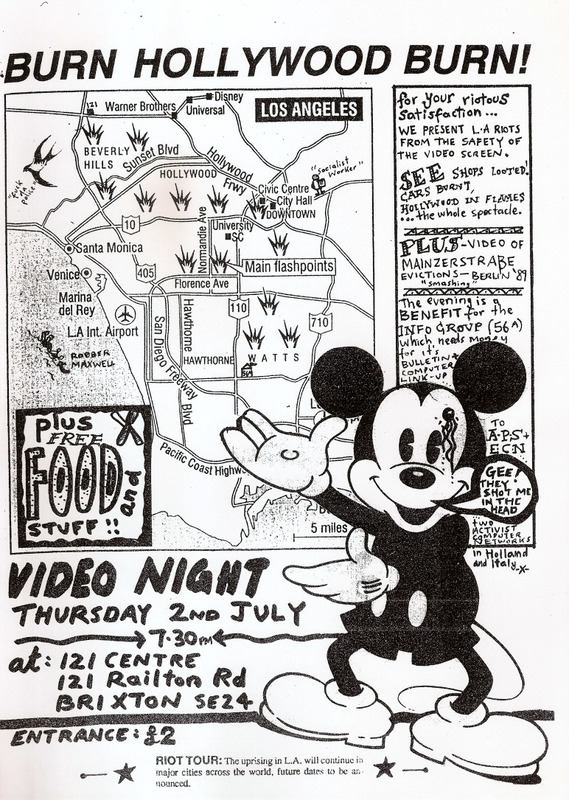 Many groups used 121 for meetings and events, including Brixton Squatters Aid, Brixton Hunt Saboteurs, Food not Bombs, Community Resistance Against the Poll Tax, Anarchist Black Cross, the Direct Action Movement, London Socialist Film Co-op and the Troops Out Movement. Publications associated with 121 included Shocking Pink, Bad Attitude, Crowbar, Contraflow, Black Flag and Underground. 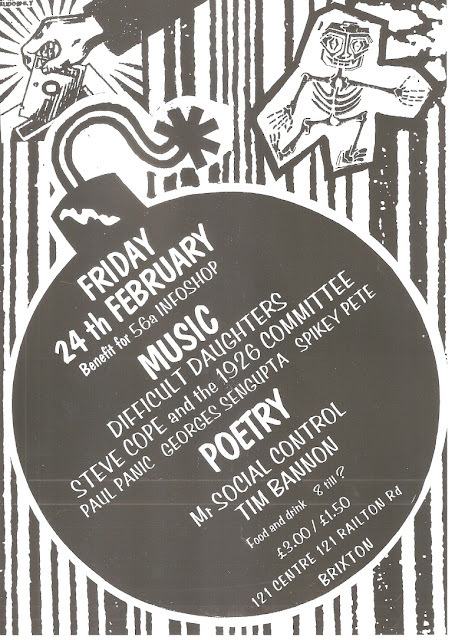 There was a regular Friday night cafe and many gigs and club nights, including the legendary mid-1990s Dead by Dawn (which I've written about here before). 121 was a venue for major events including Queeruption, the Anarchy in the UK festival and an International Infoshop Conference. 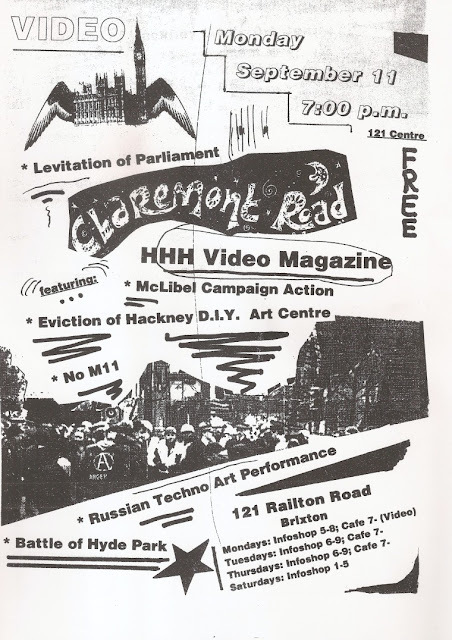 It was, in short, a space where hundreds of people met, argued, danced, found places to live, fell in and out of love, ate and drank..
(anti-Criminal Justice Act demo), the McDonalds libel trial, the 1994 'levitation of parliament; and the Claremont Road/M11 road protest. In the pre-web 2.0/youtube era, videos like this were a key way in which visual information from different movements circulated. Wonder what the 'Russian Techno Art Performance' was? Steve Cope & the 1926 Committee, Mr Social Control and others. they’ll call you animals ”. and rant to Pet Shop Boys style backing. August 1995: punk gig with Scottish band Oi Polloi and PMT, who came from Norwich. 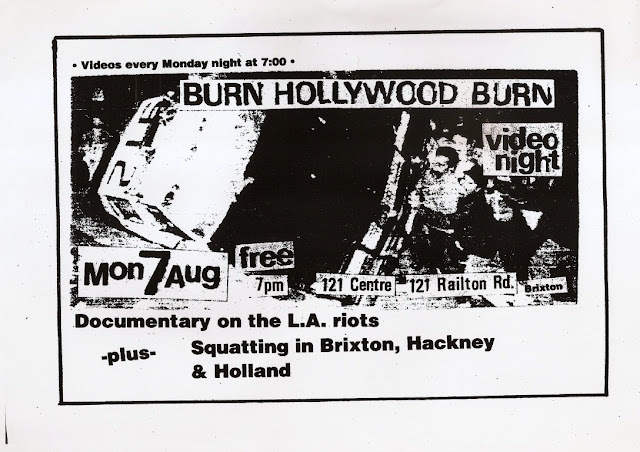 in this case film of the Los Angeles uprising, as well as squatting in Brixton, Hackney and Holland. 1992: Burn Hollywood Burn again! LA riots plus video of Mainzer Straße evictions in Berlin (1989). via which radical news and information was circulated. Yes you're right of course, it had been previously squatted by Olive Morris who among other things was involved in the Black Panthers in Brixton. Think there was a break between that and the start of the 121 Centre though. I got loads of 121 flyers! Yes Ruinist, some of these are from my personal collection, some photocopied ages ago from the file at 56a. Plenty more to come. I also still have the day book with the menu for all the cafes. Hope all's well with you. He he. Still happy with my Burn Hollywood Burn flyer! Oh man though, so many years ago! Before Youtube and all. And that LA riots video was crash edited between two old VHS domestic machines at my Dad's house. The VHS tape still lurks at 56a Infoshop prob worse for wear. Yes the Mickey Mouse image was an inspiration! The idea that to see a video you had to actually get a physical copy and get people to sit in a room and see it does seem archaic. There was also that meeting about the LA riot with some guy from Class War who I think had just been on holiday in the states with his family and ended up on the fringes of the uprising.